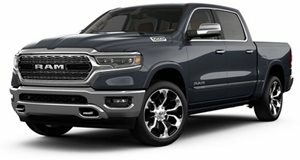 Special edition is based on the old Ram 1500 still in production. The new Ram HD may be getting the lion's share of attention, but the 1500 is the one most will buy. In fact FCA's truck division is still making the old one, and it's put a new/old spin on it with this latest special edition. Though it looks much like the Ram Rebel, what you're actually looking at is the Warlock edition. It's based on the Ram 1500 Classic that remains in production at Chrysler's Warren Truck Assembly Plant in Michigan, but goes even further back into the archives for its inspiration. The automaker based in Auburn Hills first rolled out a Warlock edition in 1976, when the Ram trucks were still under the Dodge brand. The original featured a unique gold-pinstriped black paint job (similar to Lotus' iconic JPS livery or the Pontiac Trans Am popularized by Burt Reynolds in Smokey and the Bandit) and matching gold wheels, as well as wood bedside slats. The new Warlock has none of those unique touches. Just the name. But it does carry its own special treatment, giving it a similar appearance to the Ram Rebel, but at a more accessible price. It features a one-inch lifted suspension, heavy-duty shocks, 20-inch semi-gloss black alloys, bold R-A-M lettering in the grille, powder-coated bumpers front and rear, black wheel arches, tow hooks, and more – including the requisite special badges. Inside it's done up with Diesel Grey cloth upholstery, and comes with the amenities from the Luxury Group package. All this for $35,345 (plus the $1,695 destination charge). "The Ram 1500 Classic Warlock is proof positive that value never goes out of style," said Ram chief Reid Bigland. "With its sinister monochromatic exterior, award-winning interior and great price, this mean machine is certain to resonate positively with consumers."